There is no better example of a great musical work rooted in commonplace experience than Beethoven’s ‘Diabelli’ Variations. Hans von Bülow dubbed the thirty-three variations ‘a microcosm of Beethoven’s art’, and Alfred Brendel has described them as ‘the greatest of all piano works’. Yet this enormous musical edifice was built from a trivial waltz that the composer originally dismissed as ‘a cobbler’s patch’ on account of its mechanical sequences! In order to appreciate the Variations fully we should savour their paradoxical origins. Not only did Beethoven ennoble Diabelli’s theme by transforming it into a variety of shapes and characters, but he also subjected it to critique, poking fun at its primitive aspects. The ‘Diabelli’ Variations create a uniquely coherent design of vast dimensions, filling nearly an hour in performance time. The present recording of the ‘Diabelli’ Variations departs in some details from the musical text printed in available editions, none of which is entirely satisfactory. Beethoven has prescribed no repetitions in the first halves of Variations 2 and 11, and there should be no A in the right hand in the initial chord of Variation 13 for example. In the second half of Variation 12, after the turn figure shifts from the high register into the bass, there is a bar of repetition at the crescendo, before the chords in the right hand begin to ascend. We have good reason to believe that the disputed text of Variation 15 – with its two-octave leap in the bass in bar 21 – is correct as it appears in the autograph score and the first edition. Some editors have been misled into imposing a false ‘consistency’ on the text while obscuring Beethoven’s intentional subtleties and irregularities, which in the case of Variation 15 are bound up with the humorous character of the music. 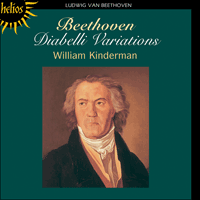 The companion to this recording is my book Beethoven’s Diabelli Variations published by the Oxford University Press in 1987 (paperback edition 1989). The book provides a discussion of the compositional genesis of the Variations coupled with an analytical guide to the finished work. Since the commentary is intended to enhance appreciation of the aesthetic qualities of the work, it inevitably remains incomplete: the analysis must be verified by the reader against his or her own musical experience. Similarly, no single recording of the ‘Diabelli’ Variations can encompass fully the aesthetic meanings embodied in the work. The intersection of book and recording offers a more comprehensive means of approach to that distinctive blending of the rational and sensuous so characteristic of Beethoven. For a recent survey of Beethoven’s music in general, and an assessment of his cultural importance, see my study Beethoven (Oxford University Press and University of California Press, 1995). Acknowledgement is gratefully made to the Research and Travel Committee of the University of Victoria for their support and encouragement, as well as to the Hochschule für Musik, Karlsruhe, Schloss Gottesaue, to Peter Eicher, and especially to Marc Seiffge.